B Local gets on with the basics – recording your customer sales and automating their rewards. Simply, with no fuss, and it’s easy to use. Loyalty is all about rewards, and B Local focuses on a rewarding loyalty lifecycle to ensure your customers turn into loyal customers. Your B Local dashboard provides data and analytics about your customers, putting all the important metrics at your fingertips. 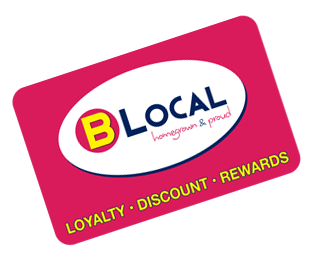 B Local is driven by first class support – we’re here to assist you every step of the way with your loyalty program. The speed of recording sales and issuing or redeeming rewards is vital to our success. Our mobile app makes the job easy and fast. In the competitive market of today, customers are accustomed to being rewarded for their loyalty. Large chains and big business put pressure on smaller businesses – B Local puts you back in the race with a loyalty program to retain and reward your customers. If you’re not growing you’re going backwards – so the saying goes. In retail, this could not be truer – which is why the repeat business and customer retention provided by B Local loyalty system is vital to the growth of your business. A hindrance in past Loyalty schemes has been the difficulty of managing the program. B Local makes it simple to run your program and reward your customers. Our mobile app has been built to be fast and easy to use, day in and day out.